As we get deeper and deeper into our organizational rankings, we get to guys who have the best chance at being something special. When you can hit 103 on a radar gun like Domingo Acevedo can, that screams special. We could be seeing this 22-year old a lot sooner than we expect. Acevedo is a big boy. He stands 6’7” and we’ve seen throughout the past how massive of an advantage taller pitchers seemingly have. Acevedo has demolished his competition during his four years of professional baseball. He hasn’t been able to pitch more than 18 games in a season, but he’s still a work in progress. It is a positive thing to note that the 18 game campaign came just in 2016, so he’s beginning to be stretched out as a major league starter. Acevedo had another excellent year statistically speaking in 2016. He posted a 2.61 ERA over 93 innings while posting a 102:22 K:BB ratio. Acevedo has also been extremely impressive keeping the ball in the yard, only allowing four homers last year and seven for his four-year minor league career. Acevedo should start his 2017 season at Double-A, if not High-A, and barring good health quickly move through the system ranks. His 9.9 K/9 he has thus far throughout his career will play at any level and will lead to a long successful career. 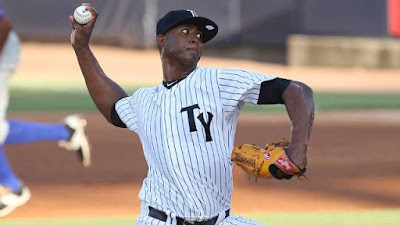 Acevedo isn’t on the Yankees 40-man roster, so we shouldn’t expect to see him this season. His ceiling is likely Triple-A, but if he did make it to Scranton, he’ll be poised to make a run at a rotation spot for 2018. That’s best-case scenario. In all likelihood, we should see Acevedo vying for a starters spot in 2019.